Growing up I was not a soda drinker nor did my parents keep soda in the house. However, to my parents’ horror (just kidding) in college,I began to indulge in soda on a regular basis. It did not help that my boyfriend at the time (and now my husband) was an avid Dr. Pepper drinker. Eventually, we both decided it was time to kick soda to the curb. In our pursuit to drink less soda, we realized we still craved the carbonation. Initially, we bought flavored seltzer water, mainly the very popular brand, LaCroix. Then I saw advertisements for SodaStream products and wondered if we could forgo the flavoring and as a bonus ditch all the aluminum cans. 60-liter CO2canister: $29.99 for initial canister, then $15 to exchange. A 60-liter SodaStream canister is equivalent to 169 cans of LaCroix (60L = 2,028 ounces, divided by 12 ounces per can equals 169 cans). LaCroix is 46 cents per can versus SodaStream is priced at 8 cents per can. 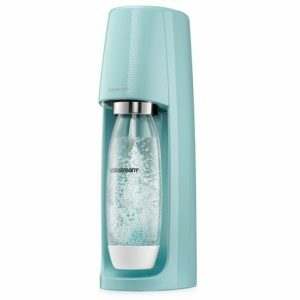 However, you have to consider the initial costs of the SodaStream machine and how long it would take you to reach the payoff point. Whether the SodaStream is cheaper in the long run than buying individual cans largely depends on your (and your family’s) consumption levels. Personally, I don’t mind if it’s not an economical win because I really enjoy the convenience and waste-reduction factors. Would I recommend this product to others? Absolutely! I love that you can customize the carbonation levels in your seltzer and that the appliance doesn’t use electricity. Most importantly, I can happily report that my family and I are reformed soda drinkers and only indulge on the rare occasion, in large part due to our SodaStream Source.